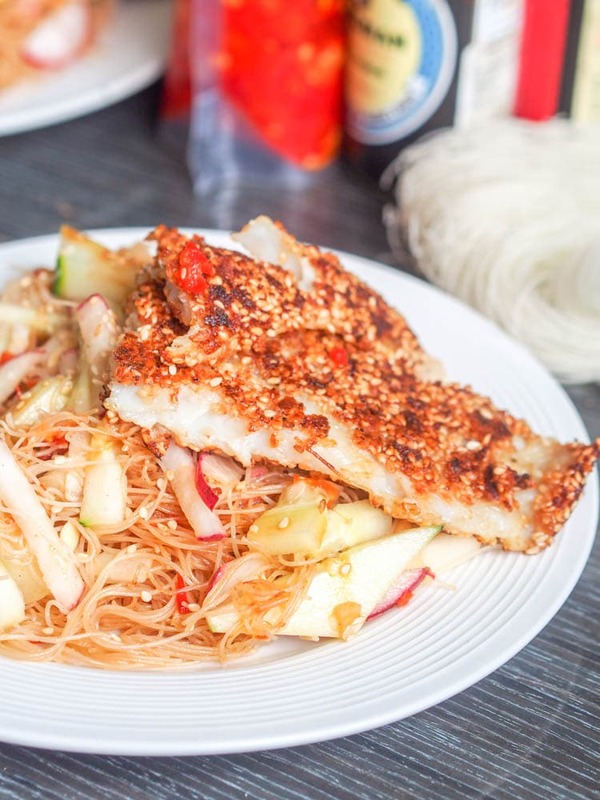 A simple 30 minute Asian noodle bowls made with thin rice noodles, sesame seed crusted white fish fillets, and cucumbers and radishes in matchsticks. A perfect weeknight dinner meal. Gluten Free and Dairy Free. D and I spent 8 straight months in Asia. It was our first continent on our 2 year backpacking trip back in 2012 and once we set foot in Japan, in September we didn’t leave Asia until the following May. One thing that made that looong stay in Asia easy? An abundance of insanely delicious Asian food. I love Asian food – love love love it. Asian noodle bowls are the best if you ask me (and if you’re on the hunt for more, check out my vegan Asian noodles with carrots and tahini, and vegan Asian sesame noodles with cucumbers and herbs). Ultimate comfort food right there. Asian soups, sushi, marinated chicken/fish, you name it, I love it. Those flavor profiles were just made for me. I’m currently traveling around South America, and while the food in Colombia has pleasantly surprised me it is still no Asian food for me. So, when I’ve got my own kitchen to cook with, you’ll find me making Asian food, to kick that craving, pretty often. I made the mistake of buying hoisin sauce at the supermarket first. I don’t know if it was something specific about the brand that I bought, or if I just forgot that I don’t like hoison sauce, but it wasn’t good. Too sweet. Wayyyy too sweet – don’t want that coating my Asian noodle bowls. Oyster sauce is where it’s at (and best of all you can find a similar taste profile in a vegan version – mushroom sauce – yay). Oyster sauce, a bit of tamari, sesame oil and chili garlic sauce is all you need for a sauce base. Sesame seeds are the best aren’t they? Too good to just be sprinkled on a dish. I want more sesame flavor. A want my fish dredged and coated in a generous layer of roasted sesame seeds. A brilliant move if you ask me. The simplicity in this recipe is what makes it one of my new favorite meals. Coat and cook the fish, while in the meantime you soak the noodles and chop the cucumber and radishes. Once the fish is cooked the noodles get a quick stir fry with the sauce, before adding in the veggies and that’s it. Dinner is ready. 30 minutes or less I tell you. I loved every bite of this dish. 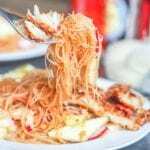 The lightly crisped up spicy noodles absorb the sauce and are balanced out with tender firm white fish and crunchy veggies. Soak rice noodles in water for 5-10 minutes. Heat pan over medium-high heat and add oil. Season fish with salt/pepper and dredge fish in sesame seeds, pushing down on the fish to make sure they stick. Cook fish in pan until browned and cooked through on both sides, 4-6 minutes per side. Remove. Add minced ginger to the pan and cook until aromatic (1 minute). Add noodles, and cook for 1-2 minutes. Add oyster sauce, tamari, chili garlic sauce and sesame oil. Mix, until thoroughly incorporated. Add cucumber and radishes and mix. 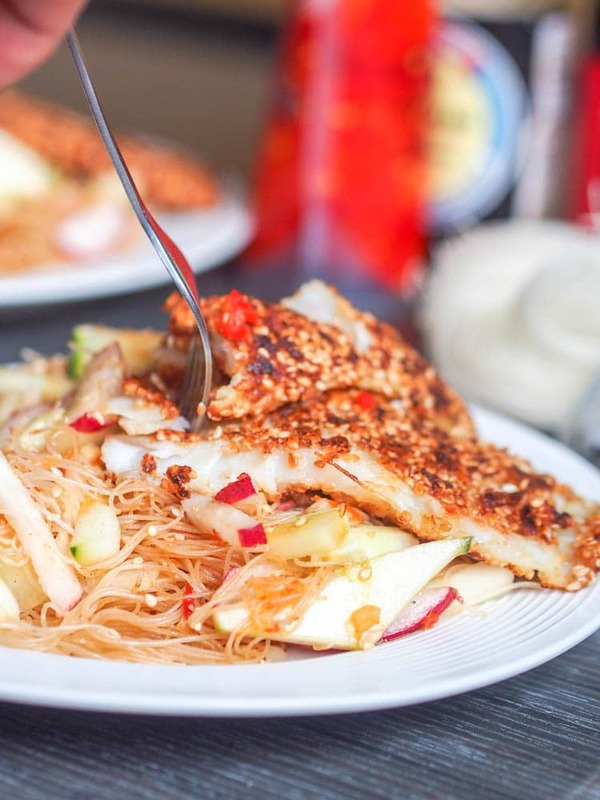 Serve noodles topped with fish and sprinkled with sesame seeds. I think I’ll have to make the salmon I have for tonight this way!! Hope you got to make it and enjoyed it !! This is such a great idea! I love spicy Asian dishes. 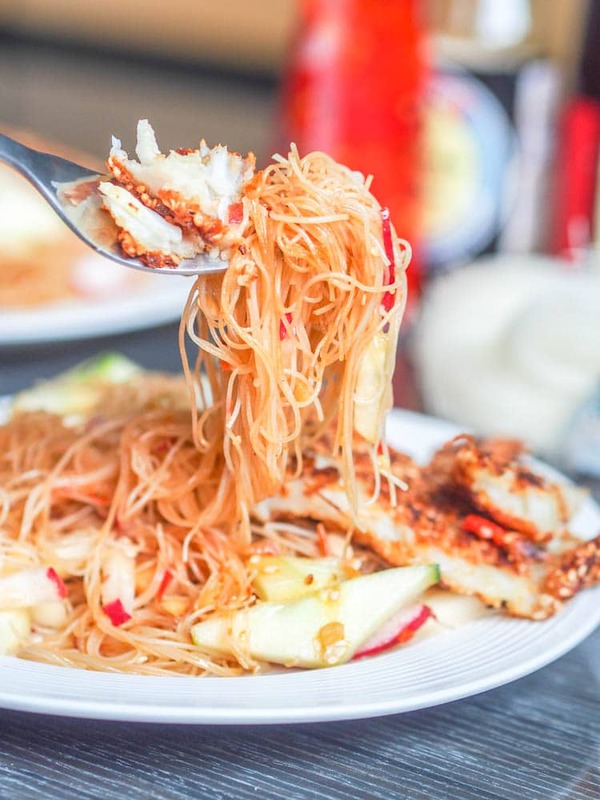 Do you think Sriracha sauce would go well with the fish? Can’t wait to make it! I am sure Sriracha would be perfect here! I just didn’t have any on hand otherwise I would have been adding it for sure!